Flu Shot Side Effects – you won’t believe it! Foods With High Magnesium – are you Mg deficient? How Are You Doing Today – feeling tired? Calcium and Bones – you have been misinformed! Calcium Supplements for Heart Disease? What is the Best Calcium Supplement for Women? What Is Type 3 Diabetes? – Are you at risk? Why Do I Have Chest Pain? Hypertension Guidelines – Danger level now classed as 130/80!! Blood Pressure : what drugs are you on? Why do my joints crack? It’s not what you think! Non-Hodgkin Lymphoma – evidence against Monsanto revealed! Glyphosate and cancer – Monsanto found guilty! Breast Cancer Screening – are mammograms safe? Reversing Diabetes Naturally – and it costs nothing! Type 2 Diabetes – what causes it? Do Diet Sodas Make You Gain Weight? What’s The Best Blender For Smoothies? H. Pylori Infection – are you at risk? Doctors are…not to be trusted? Do You Trust Your Doctor? Drugs! Are you on Diuretics? Drug Side Effects – Trust me I’m a doctor! Can Stress Cause Heart Disease? How To Sleep Well – Mg is the answer! Prostate? You may want a second opinion! Can Sepsis Be Cured? – Yes, but not with a drug! Murder by Methanol – Update, Diane has been released! Aspartame Dangers – this will shock you! Flight Safety – Pilot Error? Calcium, the most important mineral for bones? Well, actually no it isn’t. What about Magnesium, the forgotten mineral? 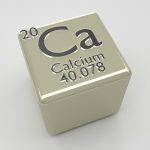 There’s no denying that Calcium is important but in this modern age, we seem to be over consuming this alkaline metal. Calcium should be found mostly in the bones and teeth but I’m afraid it’s being found in all kinds of places where it shouldn’t be. Our food is being fortified with Calcium? How many adverts do you see with ‘fortified with Calcium’ or ‘Calcium rich for strong teeth and bones’. The fact is that Calcium (Ca) is a bit of a rogue. If it isn’t under control, it can run amok in your body, causing all sorts of ailments and problems. Yes, you heard me, Ca can be a rogue, if not controlled. In fact in can be dangerous! How often do you hear parents going on about getting enough Ca into their children. How many parents stress about the Ca intake their children must have. How many parents buy foods that they consider to be rich in Ca to make sure their children grow up with strong bones and healthy teeth. Has anybody mentioned Magnesium (Mg) at all? Why are our foods being fortified? Well just think about it. Ca is the star mineral supplement. The food manufacturers are just large companies. What’s the most important consideration that a food company thinks about first? Profits! They know that you think that Ca is the bees knees and so they jump on the band wagon and produce all kinds of products with Ca because they know you will buy it, because you’re going to buy anything you think is good for you and your family. You have been entirely mis-informed and mis-guided and I’m sorry to say that this myth that loads of Ca can be nothing but good for you, is put about by many health professionals. There have been many studies about the relationship between Ca and Mg. A new study, concentrating particularly on children’s health, shows that Mg in a childs diet is the key to producing strong bones and teeth. Researchers found that dietary Ca was not significant when associated with bone mineral content or bone density. This study was presented to the Pediatric Academic Societies in Washington DC in 2013. It confirms that Mg regulates the amount of Ca in a child’s body and consigns it straight into the bones where it belongs. If Mg is not in sufficient quantities in the body, Ca ends up depositing into parts of the body where it does not belong like the kidneys, coronary arteries and cartilage. 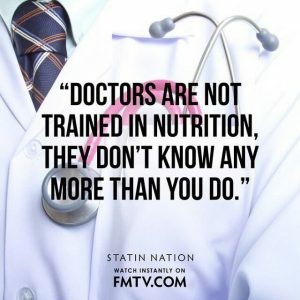 One of the problems is that our medics are not trained to be aware of the benefits of vitamins and minerals. This is not their fault, their training does not deal with wellness and naturopathy and much of it is under the control of big pharma who deal with sickness and the drugs that can be used to manage that sickness. You notice I say ‘manage’ not cure. Secondly, our soils are so depleted in natural vitamins and minerals due to agricultural practices, fertilizers and pesticides, that most of the population is now deficient in many nutrients, Mg being the one exceptionally important to our well-being. For a start, if you or your children are taking Ca supplements while still eating dairy produce, milk and other normal foods, then don’t. If a medic has advised you to take Ca without taking Mg, I would question it. Do your own research. This is your body and your children’s welfare we’re talking about here. Get genned up and learn what your body needs to be healthy. If you approach your doctor about the benefits of Mg, don’t be surprised if you get a frosty reception or a blank look. We should all take a stand against taking drugs when an important nutrient will do the job as well and with no side effects. Check out this site about the ailments you could succumb to if you don’t have enough Mg in your body. The ratio between Ca and Mg should be around 1:1. At present, it is estimated that the normal diet ratio is coming out between 5:1 and 10:1. Just do a quick check of how much Ca you ingest in a day and then compare it to your Mg intake; you’ll be surprised. Ca is in many foods and the food manufacturers often fortify with Ca. How often to you see Mg being fortified? How often do you see Mg even being mentioned?!! Women are more at risk! Why are we being mis-informed? This is a typical example of mis-information. They fail to inform the patient that in fact Vitamin D production will be hindered with a Mg deficiency which will further weaken bones. Also without sufficient Mg, Ca metabolism will be compromised which will lead to Ca migrating away from the bones and towards areas of the body it shouldn’t be, such as the kidneys! Osteoporosis sufferers, according to surveys, have low levels of Mg in their bodies. Dr Thomas Levy wrote in his book Death by Calcium “Recent scientific data provides an overwhelming case against calcium”. Osteoporotic bone has too little Ca in it, that’s true. But the rest of the body has too much Ca which settles in unwanted areas and soft tissue. The longer osteoporosis has been in the body, the greater the excess of Ca outside the bone. 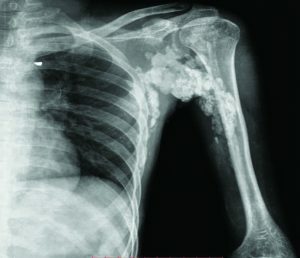 The image shows massive calcification in the upper arm. How did it get there? Mg has a massive impact on the quality of our bones. Mg activates an enzyme needed to form new bone. Mg is necessary to activate vitamin D to help Ca absorption. Mg stimulates calcitonin, a hormone which helps maintain bone structure. Mg ushers Ca out of soft tissue and blood into the bone where it belongs. This reduces the incidence of kidney stones and arthritis. Research has shown that the little known vitamin K2(MK7) along with Mg and vitamin D3 will actually help remove Ca from soft tissue and usher it to the bones where osteocalcin takes over to keep it there. Mg inhibits parathyroid hormone, preventing it from weakening bones. Moderate levels of Mg are vital for absorbing and metabolizing Ca. Take a Mg supplement. Even without checking, you will surely be deficient. Mg is just not in our food anymore, to the degree it was a century ago. Stress is another Mg depleter. We are all under immense mental and bodily stress in this modern age and this will reduce our Mg levels. We need Mg like we need water. It is one of the most fundamental nutrients and electrolytes. Without it you will be unwell and could even suffer serious side effects, not least heart disease, stroke, atherosclerosis and diabetes. Many of the drugs we take for these conditions can deplete Mg further. Mg citrate is ideal if you require a gentle laxative effect and it can be taken orally in powder or tablet/capsule form. Many who are Mg deficient, suffer with constipation. The powder form allows you to adjust your doses very accurately to suit you. It is also very useful for child constipation as it is completely tasteless and can be put into drinks or soups etc.. If you don’t want a laxative effect then go for Mg chloride (MgCl2). This compound is totally bio-available and is by far the best supplement IMHO. (ReMag produced by Dr Carolyn Dean is MgCl2). Ionic Mg is also MgCl2. It can be used topically too. It is easily absorbed through the skin and those with a sensitive stomach will appreciate this form of Mg supplement. For those who don’t like the taste, it can be easily disguised with a drop of cordial. Mg oxide is the cheapest form of supplement and needs to be avoided. It will generally be inside inexpensive multivits and other low-priced supplements. It is poorly absorbed so you need a hefty dose most of which will go straight through you. Start searching for the best supplement for you and notice how different you feel after taking it for just a day or two. You will have more energy, you will sleep better, your digestion will improve, back aches, muscle spasms and cramps will diminish. The benefits are endless. By the way, an adult needs between 300 and 400mg of elemental Mg per day, minimum. I take between 500mg and 600mg per day of Mg Chloride, depending on what I’ve eaten. All my previous ailments have gone, including insomnia, digestion problems, eye twitches, back ache, painful muscle spasms, sciatica, brain fog, anxiety, depression, stress, anger, irritability, sound familiar? I’ve now started a new beginning and I feel great!! I want you to feel great too! Further to my trilogy Flight Safety, Flight Safety – Pilot Error and Flight Safety – Aircraft Accidents of 2015, Flight Safety – Epilogue shows some interesting research which could actually back up the suspicion of aspartame causing neurological and psychiatric problems for pilots. This research particularly concentrates on depression and suicidal thoughts that pilots suffer from. The fact that so many pilots are admitting to these conditions could be a sign that some are in fact ingesting aspartame on a regular basis. This could exacerbate or even cause their conditions. This survey was started soon after the Germanwings flight 9525 tradegy where 150 people were killed, supposedly on purpose, by the co-pilot of the aircraft Andreas Lubitz. There is no doubt that this young man, who was an accomplished pilot, was in mental turmoil and had been so for some years. I am not defending this young pilot, what he did was horrendous. But looking for an answer as to why he did it, could possibly avoid this kind of devastation happening again. One thing about a person who wants to commit suicide. They will not want to take others with them. Not caring about killing innocent people, is a person who is suffering from psychotic tendencies. 1 in 8 pilots could be depressed. The Harvard T.H. Chan study goes into how many pilots have depression and other mental problems and comes up with a multitude of statistics. Perhaps the most worrying of these are the percentages of pilots who admit to having suicidal thoughts. Out of a potential of 3485, 1837 pilots (52.7%) actually cooperated by filling in questionaires. 75 of those pilots (4.1%) reported having suicidal thoughts within the past 2 weeks and 233 pilots (12.6%) met the depression threshold, that’s 1 in 8 pilots. There are approximately 140,000 airline pilots around the world with half of them in the United States. If you relate the figures above of 4.1% of pilots thinking suicidal thoughts, the total number of pilots in the US having these feelings could be as many as 2,870 and worldwide 5,740! This is a shocking revelation and is something the FAA (Federal Aviation Administration), the CAA (Civil Aviation Authority) and other aviation authorities throughout the world, should be all over this research like a rash, not to mention the commercial airline companies themselves. Being an airline professional has a kind of celebrity status. Being a pilot is considered, by most, to be a worthy career with pilots considered as being especially gifted and accomplished. Pilots and crew want to look good and being overweight is not in keeping with their image. Hence many do their best to keep fit and trim and consuming dietary products is deemed to be helpful to that cause. They probably have no clue that ingesting aspartame laced sodas, hot drinks and food stuffs could actually threaten their career and worse, be the cause of an airline accident, possibly causing loss of life. This apart from not helping weight loss. Those using aspartame are more likely to gain weight! If you were a pilot who had mental health symptoms that could jeopardise your profession, what would you do? It is only human nature to hide illnesses and conditions that could impact on your career, especially if they are mentally related. A pilot has to declare any problems he may have which were not obvious to an observer. It won’t be until someone else observes the problem that it will be reported. Even then, it is known that pilots will protect their colleagues. There was an incidence when a pilot has a seizure whilst in the cockpit, but because it only lasted a few minutes, it was not reported. This event came out in a confidental phone call to Mary Stoddard who set up the Pilot Hotline back in the last century to help pilots with aspartame reactions. It is admirable that this study was confidential and it explains why so many pilots were willing to participate and answer the questions honestly. If it had not been an anonymous survey then I suspect those that did fill in any questionaires would have lied about any conditions that would impact on their licence to fly and who could blame them. There were many questions about various characteristics of the participants. I found it interesting that a question was asked about ingestion of alcohol and sleep aid medicine. Not once was there a question about dietary habits in this questionaire. If only they had asked about ingestion of foods, including diet drinks and other products. A possible link may have been found. Even if the 92 symptoms I mentioned in my last post was accepted by the FAA, they would ignore it. This despite 75% of reported side effects of food additves to the FDA concern aspartame. So why is this? 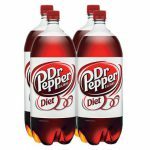 Because they are politically connected to the FDA who passed this toxin in the first place, under a cloud of fraud and misdemeanour, way back in 1981 and again for carbonated drinks, in 1983. In other words, its all to do with politics and financial gain. If aspartame was banned, the loss to those companies that have a vested interest in it would be catastrophic and detrimental to their business and there lies the problem. No matter that it’s damaging the health of the population. As for the health of pilots and crew and the subsequent safety of passengers, the only way to stop consumption of aspartame laced products is for the public to be aware of the dangers. With public awareness of what aspartame can do neurologically and psychologically they will not want those in control of their flights to be ingesting this chemical and thus taking chances with their lives. If just one pilot is unknowingly being affected by this sweetener, he could be the cause of an aircraft disaster. It’s a pity that Andreas Lubitz’s history of consumption of food and drink was not scrutinised as part of the crash investigation. If it was found that he regularly ingested aspartame and that it could have exacerbated or even been the cause of his psychotic behaviour, the media would have informed the public. A public outcry is the only way this toxin will be removed from the market. “Unless investigators recognise the toxic role of aggression and hostility in some patients’ depression, such troubled individuals will continue to elude detection – to the public’s peril”. The aircraft industry is missing a vital clue to what could be happening with pilot error cases. This was actually addressed in the late last century by a multitude of aviation magazines and media, so why has it all been forgotten? If there’s just a chance, that consuming the chemical aspartame could have an effect on a pilot’s mental acuity, then they should be doing something about it. Not doing so could be just as dangerous as a mechanical failure. In fact you could class it as that, except the machine is biological! The FAA won’t protect pilots, pilots have to protect themselves. One of the aircraft industry’s acronyms “I’m Safe” check is one way of looking honestly at your own health. I’ve added one more letter to make the acronym “AM I SAFE?” which includes the ingestion of Aspartame. Aspartame Medication Illness Stress Alcohol Fatigue Emotion. If you can honestly say you pass each one of these potential problems, IMHO you will be as safe to fly as you can be. Being fit in all these areas will enable a pilot to do his job to the best of his ability. He will be keeping his passengers and crew safer. He will be alert and follow procedures in an emergency. He will then not lose his licence. Tinnitus – ringing and buzzing sounds in the ears. These are known symptoms but how many symptoms did he suffer that we didn’t know about. He was seeing a large number of doctors and this could certainly be a sign that the medics did not know what he was suffering from, except from the obvious severe depression. It would be easy for crash investigators to contact family and ask about eating and drinking habits. It could be enlightening! This website is dedicated to informing the public about the dangers of a magnesium deficiency. Aspartame is known to deplete magnesium levels at an alarming rate. Aspartame is an excitotoxin that when consumed in high amounts, reacts with receptors in the brain. This can cause damage to certain types of neurons. Many neurosurgeons and neurologists now consider that excitotoxins play a vital role in developing many neurological disorders. Those such as headaches, migraines, tremours, seizures, panic attacks, aggression, anxiety, Alzheimer’s, Parkinsons’s, Huntington’s, ADHD to name but a few. This video explains succinctly what magnesium does at the cellular level. In high concentrations as in this food additive, excitotoxins constantly stimulate the cells. This can cause a process of cell death known as excitotoxicity, where calcium channels are kept open. This allows excess calcium into the cells, exciting them to death. If the body has good magnesium levels, the affect of excitotoxicity from free amino acids will be reduced. This is because magnesium is the ‘gatekeeper’ of the calcium channels, closing them to calcium when it’s not needed in the cell. The side effects and adverse reactions from aspartame are very similar to a magnesium deficiency. In effect it’s a double whammy. If you are consuming aspartame, you will be depleting your magnesium levels and it becomes a vicious circle. Serious problems will ensue if the issues are not addressed. There have been numerous studies on aspartame. More than 70 studies done by the aspartame industry concluded there were no side effects from aspartame. More than 90 studies independently done outside the realms of the aspartame industry, found serious side effects from aspartame. Which studies would you believe? I would be pleased to read any comments you have about this Flight Safety trilogy and epilogue. Thank you for reading and please, please avoid food and drink that contains aspartame. In total, there were 31 aircraft accidents in 2015. Of those accidents, 17 were put down to human or pilot error, 1 unknown and one is still under investigation. 7 were due to mechanical failure, 3 aircraft were shot down, there was 1 bomb and 1 was due to bad weather. From Toronto to Halifax. Landed short of the runway and was severely damaged. Twenty-three people were injured. 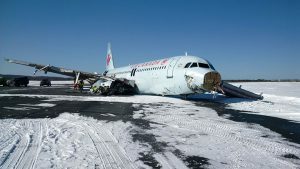 The TSB (Transport Safety Board) stated that there were no mechanical or maintenance faults uncovered with the aircraft. Evidently the most common cause of major airline accidents is “controlled flight into terrain” known as CFIT. Pilots flying perfectly sound aircraft into the ground because of lost spatial awareness and not following protocol. Investigation is ongoing. Regular short-haul flight from Incheon International Airport, South Korea, to Hiroshima Airport, Japan. Airbus A320-232 touched down short of the runway. The aircraft suffered substantial damage. 82 people aboard, 27 injured, 1 seriously. Causes: Pilot error. PIC (pilot in charge) did not comply with the regulations and Standard Operating Procedures (SOP). Probable that the Crew Resource Management (CRM) did not function appropriately. Flight from Bishkek Airport, to Osh Airport. Touch down hard enough to shear off the left and right main landing gear. The aircraft skidded off the runway with the left engine being torn from its mount. No fatalities, 14 injured 4 seriously. Causes: Pilot error. Failure of the crew to comply with SOP. Faulty steering inputs by the captain. Lack of rectification by first officer of captian’s error. Lack of control of speed when the pitch angle increased. Somatogravic illusion or nose up illusion, perhaps due to fatigue. (Somatogravic illusion is a vestibular illusion prevalent during high accelerations/deccelerations when a pilot has no clear visual reference.) Insufficiently vigorous nose up input in reaction to ground proximity warning. 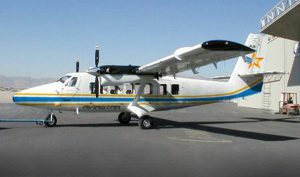 Scheduled 60-minute passenger charter flight, operated by Aviastar reported that the de Havilland Canada DHC-6 Twin Otter aircraft, was missing from air traffic control near Palopo 11 minutes after takeoff. There was no distress call from the plane. 10 dead. Causes: Pilot error. The NTSC (National Transportation Safety Committee) concluded the pilots changed the route and did not discuss or consider the environmental conditions that may be ahead or discuss the operational implications of flying another route instead of the one planned, leading to loss of situational awareness. Delta Air Lines domestic passenger flight between Atlanta and New York’s La Guardia Airport. The McDonnell Douglas MD-88 aircraft veered off the runway shortly after landing at La Guardia Airport. No fatalities, 24 minor injuries. The aircraft was seriously damaged. Causes: Pilot error. NTSC found that the pilot used excessive reverse thrust which degraded the effectiveness of the rudder controlling the aircraft’s heading. Scheduled international passenger flight operated by Germanwings, from Barcelona to Düsseldorf. The Airbus A320-211, crashed into the French Alps. All 144 passengers and six crew members were killed. Causes: Pilot suicide. The crash was deliberately caused by the co-pilot Andreas Lubitz. After reaching cruising altitude and when the captain was out of the cockpit, Lubitz locked the cockpit door and started a controlled descent. The aircraft crashed into a mountainside in the French Alps. Upon searching his property evidence was found that Lubitz had been declared unfit for work by his doctor. This fact was hidden from his employers. Lubitz had suffered severe depression for a long time as well as a constant ringing in his ears known as tinnitus. He was plagued by insomnia and vision problems, complaining that he was seeing stars, halos, flashes of light, streaks, and flying insects. He also had light sensitivity and double vision. His ophthalmologist said “he was full of fear”. His family doctor diagnosed an “emergent psychosis“. He was said to be motivated by fear of losing his licence because of his sight disorder. With the fear of blindness he started researching ways to commit suicide. He was prescribed mirtazapine and lorazepam. Lorazepam should not be taken if a patient has suicidal tendencies. The conditions I have highlighted are all common side effects of aspartame ingestion. If Lubitz had been using aspartame over the previous years, regularly drinking diet sodas, putting ‘equal’ into hot drinks, consuming diet foods such as yoghurts, puddings and other aspartame sweetened products, he could have succumbed to psychotic tendencies. His obvious suicidal tendencies is further evidence of possible aspartame reactions, apart from the drug lorazepam he was taking. Suicide is a personal and individual act and committing murder is not normal for those wishing to end their lives which could indicate a psychotic state of mind. 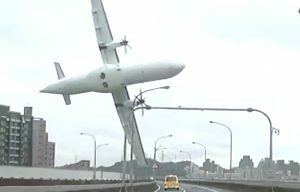 A ten-month-old ATR 72-600 aircraft crashed into the Keelung River shortly after takeoff from Taipei Songshan Airport. The TransAsia Airways flight was flying from Taipei to Kinmen (Quemoy), a Taiwanese island off the coast of mainland Fujian. 38 dead, 15 survivors. Causes: Pilot error. There was an uncommanded autofeather of engine No. 2. The pilot reduced power and subsequently shut down operative engine No. 1. There was a failure by the flight crew to use SOP which resulted in confusion in identifying the nature of the propulsion system malfunction. Why are these pilots not following their training? Whenever there is a pilot error incident, IMHO, because the FDA refuses to take aspartame off the market, other measures need to be put into place. 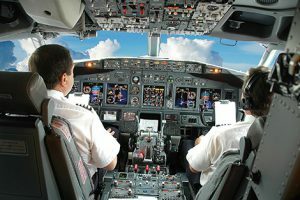 Apart from considering fatigue and stress during an investigation, consumption of aspartame laced dietary products should also be considered as a possible cause of impaired mental acuity, confusion, anxiety, irrational behaviour and other symptoms that could adversely affect a pilot’s ability to cope with an emergency situation. 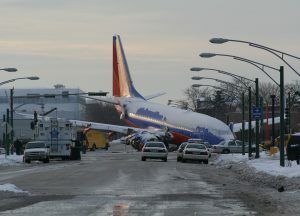 Some of these pilot errors are just so obvious! 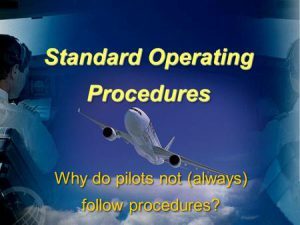 Why would the flight crew fail to use SOPs. What about CFITs. 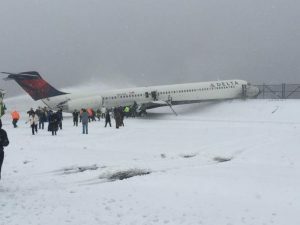 Unless there is a serious problem with the aircraft or bad weather why would an experienced pilot fly into terrain and not make the airport runway or shut down the wrong engine? Since 1984, I have found 11 incidences where the wrong engine was shut down or feathered, killing 204 people in total. Again, the errors often seem quite mundane and you would expect an experienced pilot to cope with these difficulties during a flight, unless there’s something seriously wrong with the aircraft or exceptionally bad weather. Civilian Two helicopters collided near Villa Castelli in Northwest Argentina. 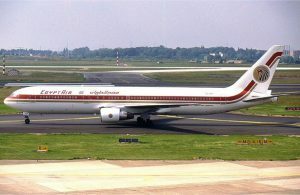 All ten people on board the two aircraft were killed. Cause: Pilot error. A video of the accident appears to show that the lower of the two helicopters climbing at a rate faster than the other one, colliding with it from below. Civilian An Embraer EMB-505 Phenom 300 crashed into a car auction site in Hampshire, United Kingdom, killing pilot and three passengers. The pilot overshot the runway during the landing attempt. Cause: Pilot error. 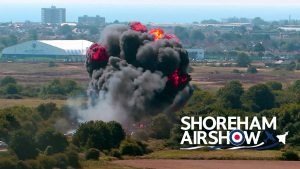 Airshow A vintage jet aircraft crashed during a display at Shoreham Airport, England. 11 dead, 16 injured. Cause: Pilot error, the aircraft was too low to perform the loop. Air Show Training. A 2015 Červený Kameň mid-air collision occurred when two Let L-410 Turbolet aircraft collided in mid-air over Červený Kameň, Slovakia, and crashed in a forest. The aircraft were carrying 17 parachutists and 2 pilots each. 7 killed, 31 survived. Cause: Pilot error. The agreed distance of 100m apart for these two aircraft was not adhered to with one plane becoming closer to the other lead plane. The captain, and Pilot Flying, was recording video on his mobile phone. He held the phone in his left hand and the controls in his right hand! Commercial Turkish Airlines Flight 1878 from Milan, Italy to Istanbul, Turkey. A very hard touchdown resulted in substantial damage to the starboard wing and a fire. At a second approach attempt, the plane veered off the runway. All 102 passengers and crew survived. Cause: Human error. The flight crew claimed the wake turbulence from the plane that landed ahead of them caused the accident. I’m not sure which human was at fault here, was it ATC, bringing the flight in too close to the plane ahead, or the pilots who may have reacted inappropriately? Cargo An Antonov An-12 cargo plane crashed shortly after takeoff from Juba International Airport serving South Sudan. 37 dead. 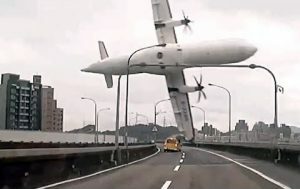 Cause: Human error, overloading of aircraft. Cargo An Airbus A400M Atlas cargo plane on a test flight crashed at La Rinconada, Spain, close to Seville Airport. 4 killed 2 survivors. Cause: Human error, incorrectly installed engine control software. Cargo Carson Air Flight 66, was a Swearingen SA226-TC Metro II, on a domestic cargo from Vancouver to Prince George, both in British Columbia, Canada. The aircraft crashed into a mountain en route to Prince George Airport, killing both crew members. Cause: not established. An autopsy found one of the pilots had a blood alcohol level of 0.24%. Commercial Ceiba Intercontinental Airlines Flight 71, a Boeing 737-8FB flying from Dakar to Cotonou collided with an air ambulance operated by Senegalair over eastern Senegal. 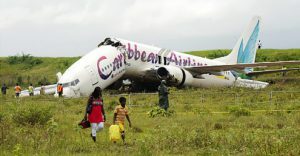 The 737 landed safely, but the air ambulance crashed, killing all 7 on board. Cause: The Air ambulance HS (Hawker Siddeley)125 was asked to fly at a height of FL340 but was actually flying at FL350, the same height the Boeing 737 was given. The HS 125 has never been found but was thought to have gone into the ocean. 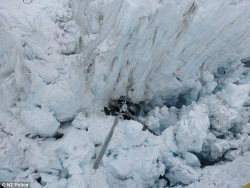 A sightseeing Eurocopter AS350 helicopter, operated by Alpine Adventures, crashed on Fox Glacier in the South Island of New Zealand. All seven people on board died. Cause: Human error. The helicopter had been involved in three previous crashes before this fatal one. The CAA advised that the operating licence of James Patrick Scott had been surrendered. Scott and Waterland plead not guilty to the Health and Safety charges. The company’s 15 helicopters were grounded. Commercial Trigana Air Service Flight 267 by Indonesian domestic airline Trigana Air Service from Sentani to Oksibil eastern Indonesian. The aircraft crashed about 30 minutes after takeoff, killing all 49 passengers and five crew members. Cause: Human error. It was found that the flight manifest was from another Trigana flight. Of all the pilot errors, so many of them seem to be unlikely for a fit and fully trained pilot to make. There is a possibility that these pilots and crew could have been influenced with something ingested. A pilot who would not comply with SOP, would seem very unlikely, unless that pilot was experiencing a loss of mental acuity or other problems such as severe headaches, vision problems, confusion, memory loss etc. Fatigue and stress could also be a contributory factor as a pilot’s schedule is nearly always hectic. There are 92 known side effects of aspartame. I’ve listed some below which IMHO could adversely affect and interfere with how a pilot and crew fly their aircraft, especially in an emergency and having to comply with operating procedures and make complex manoeuvres. Add these side effects to fatigue and stress and you could understand how a pilot may suffer a serious episode, which he would have no control over. Psychological side effects: acute depression, panic attacks, irritability, aggression, anxiety, personality changes, insomnia, phobias, psychosis. Neurological side effects: epileptic seizures, severe headaches and migraines, dizziness, tremours, confusion, memory loss. Eyes: decreased vision, blurring, bright flashes, tunnel vision, decreased night vision, blindness in one or both eyes. Physical side effects: palpitations, tachycardia, shortness of breath, high blood pressure, gastrointestinal problems, skin allergies, respiratory allergies. This Captain landed the 747 on a VERY short runway, hence the applause! 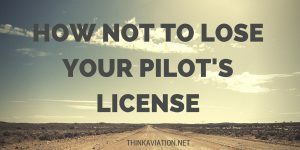 Are you a pilot or have a pilot in your family? Whether you’re a pilot or not, do you use aspartame products such as diet coke, diet pepsi, sprite or other diet sodas? Do you use NutraSweet, Equal, Spoonful, Equal-Measure, Neotame, NutraSweet. Have you had any experiences or know of pilots or crew that have had a health problem whilst on board a flight? It would be great to hear from you, even if it’s anonymously. Even if you don’t make contact, please, please stop using this chemical concoction. If you want to know how and why aspartame was passed by the FDA have a look here. It is a shocking trail of fraud and misdemeanour. Captain Osbon is suing the airline JetBlue for failing to do anything about his behaviour, which he had no control over. He gave plenty of clues of him suffering a brain seizure by being out of character, missing a preflight meeting and turning up disheveled, disoriented and slow to respond. This behaviour was apparent from when he first arrived and throughout preflight, boarding and flight checks. He should have been pulled from the flight and health checked. 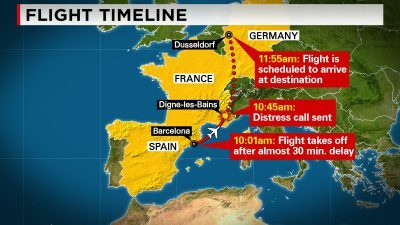 Captain Osbon decided to sue the airline after the the crash of Germanwings flight in the French Alps, which killed 150 passengers and crew. The pilot downed the plane deliberately. Do modern pilots know the dangers? We are now in 2019, so what’s happened over the last 20 odd years? It would appear all has been forgotten and pilots, crew and passengers are still at risk. The media, governments, the FDA, the manufacturers and all those to do with getting this toxin onto the market and who are lining their pockets, have done a brilliant job at keeping the public in the dark. This being at the expense of public health and the public purse. When will the truth about this dangerous fiasco, be realised by the public at large? Beware everyone, but particularly you pilots and pregnant mothers! You both have others on board! I give below a list of all the commercial accidents between the dates of 1994 and 2014. This period seems to have been forgotten when it comes to knowing the adverse affects of aspartame on pilots and crew. Some of these pilot errors just don’t make sense. 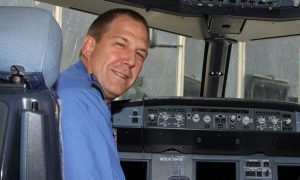 I found this article on the web written by Captain Pat Boone and it’s worth a read, especially if you’re a pilot or crew member. Loss of spatial or situational awareness. Not following SOP (standard operating procedures). Failure to perform the “I’M SAFE” checklist ie. Illness, Medication, Stress, Alcohol, Fatigue, Emotion. The last item I think is vital for any pilot to check before he/she embarks on a flight with so many souls in their hands. There are some amazing pilots out there. 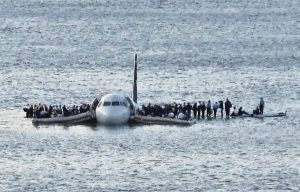 How about Chesley Sullenberger who gently ditched his stricken plane into the Hudson river with no fatalities. 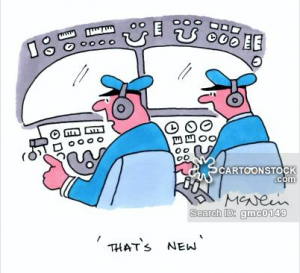 I think most pilots have the ability and skill but other factors are interfering with their job. One is fatigue, another is pressure and a third, aspartame, could add to these problems, compounding what a pilot already has to contend with. 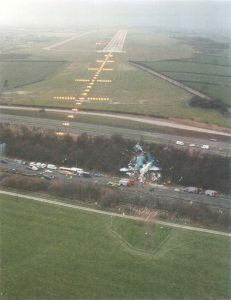 Then there’s the 1989 British Midlands Flight 92 crash, known as the Kegworth air disaster. 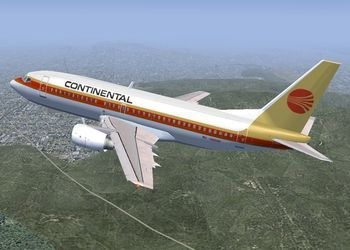 Thinking he knew the plane, the captain presumed that the smoke in the cockpit was coming from the right engine which bleeds air for the air conditioning in variants of Boeing 737 and he consequently shut it down. However, this new variant Boeing 737-400 bleeds air through both engines for the air conditioning; it was the left engine that had failed. Shortly thereafter the plane lost all power. The captain was in the process of checking his decisions when he was interupted by a transmission from East Midlands Airport informing him he could descend to 12,000 feet (3,700 m) ready for landing. The crew gallantly tried to glide down to the runway, missing it by a few hundred metres as shown in the picture. Amazingly there were survivors but 47 out of the 118 on board died. The two pilots survived with serious injuries, but both were dismissed. These were good pilots, trying to think quickly in a dire situation but the captain took something for granted, easily done. Another incident of shutting down the wrong engine! You may not have realised that there have been so many aircraft accidents over the past 20 years. What is shocking is the amount of recorded pilot errors. I just don’t believe that all these pilots are so incompetent. I think fatigue has much to do with it but also some of these professionals will be consuming diet food and drink laced with aspartame. When they do, they are more at risk of having side effects from this chemical concoction. Even without fatigue, they will be more susceptible to loss of mental acuity, impairment of vision, seizures, serious headaches, brain fog, tremours, confusion, anxiety, personality changes, phobias, the list extends to 92 side effects and adverse reactions. 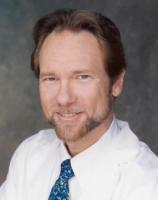 Former USAF and Continental Airlines pilot Haynes Dunn says that aspartame ruined his career. He suffered a grand mal seizure in 1990 which resulted in his flying status being automatically terminated. He states that he is not an epileptic and only has seizures when he consumes food and drink containing aspartame. Pilot Charles King had similar symptoms to Major Collings (see Flight Safety Part 1), only suffering them during his use of Aspartame products. The FAA revoked his medical certificate when he told of his problems but despite losing his licence for a few years, King managed to get it back. Regaining a licence to fly after a serious medical issue, is very rare. Why are pilots still ingesting aspartame? Although in the last century pilots were advised to lay off the diet sodas etc., in our modern day, this seems to have been forgotten. 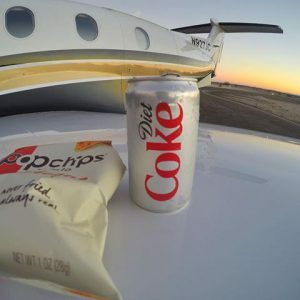 I think it would be quite reasonable for future passengers to hand over a request to their pilots and crew asking that they do not consume diet sodas and other products containing aspartame before and on their flight. If this was done by even some passengers, perhaps it would make pilots and flight attendants think. The last thing you will be after ingesting aspartame is refreshed! Who do you believe, big pharma? There are always two sides to every story but the problem with aspartame is, those telling us that it is safe have a vested interested in it. 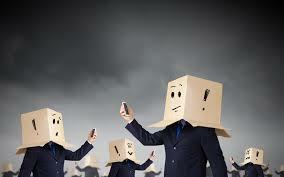 They are gaining billions of dollars every year by the sale of this concoction to you the consumer. Or those who have nothing to gain by informing you? On the other hand, those who are alerting you to what’s going on, have no axe to grind and have nothing to gain by imparting this information. These independent doctors, researchers and others and the above pilots, are just trying to give you the facts so you can be aware about this artificial sweetener and decide whether you want to consume it and give it to your family and loved ones. My next post will be looking more closely at just one year of aircraft accidents, the year 2015. I chose this year because any later, the accident investigations would not yet be complete in most instances. The majority of the investigations for 2015 have been finished and reports available. If you are a pilot, or a have a pilot in your family, we would be interested to hear your views. Perhaps you are a steward or stewardess or other member of the flight crew. Do you know of anyone who has had an episode whilst on a flight. Do you know any pilots and crew that ingest diet products on a daily basis such as diet coke, sprite, pepsi, chewing gum, equal etc.. Aspartame is everywhere and it is difficult to track which foods you are consuming that have aspartame in them, after all there are over 6,000 of them! Sick, Sad World – how did it come to this? Be wealthy with Wealthy Affiliate. This website was done using WEALTHY AFFILIATE and it has changed my life and it will change yours!